Welcome to my blog. My name is Brad Beller and I currently live in New Orleans, Louisiana. I grew up a little further west of here in a much smaller town that most people have never heard of, Estherwood. I have always loved making things and being crafty...just ask my mom about all of the sequins and glitter that always seemed to be everywhere. I started making wreaths in December of 2012 just to see if I could make them as nice as the ones that I had seen. It turned out that they were really nice. Eventually, my friends and family convinced me to start selling them and now it seems that all of my free time is spent crafting or promoting or something involving my little craft business. I would still me making things even if I wouldn't be selling them because I absolutely love it. So take a look at some of my creations and feel free to let me know what you think. I would eventually like to start putting together some How To Posts, but I have to build up to that and find the time. I do work a full time day job which pays the bills so finding the time to do everything necessary to run a small home based operation like mine is difficult at times...but I manage. I really like working with people to come up with different ideas for their home or event. I have included a page for custom designs that I have made as per customer requests. To date, no complaints!! 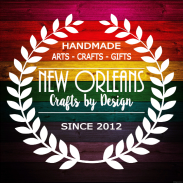 Please feel free to use the contact form to send me an email to discuss your particular wants or needs or send me email me directly at neworleanscraftsbydesign@gmail.com. I will respond as quickly as possible. Also, I can recreate, to a certain extent, most of the the designs you see posted. I try to make a variety of sizes and styles to fit any ones budget needs. You will always know upfront the cost of the item I will be making and will be no hidden or extra fees added on later. I can also include a few options of payment. PayPal: You do not need a paypal account. All you need is an email address. After discussing pricing and shipping information I would send you an invoice to your email account with item description, etc. If it a ready made item, it will be shipped as soon as payment is received. If it is a custom item, I will begin construction once half of the payment is received and then ship the item once the final payment is received. Please email me with any questions or concerns regarding this payment method. Etsy: I do have a shop on Etsy and would be happy to create a custom listing for you through my shop. Ebay: I also have a store on Ebay and can create a listing for your item that way as well. I want everyone to feel comfortable when making a purchase online. 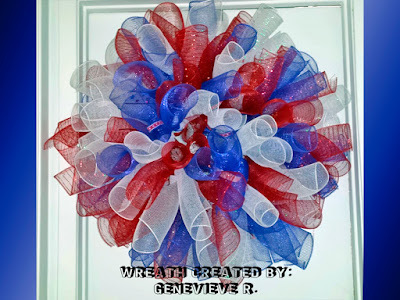 My prices will vary depending on the style and type of wreath and extra items added to the wreath. I can make wreaths to fit anyone's budget...just contact me and let me know. Shipping not included in price of the items. On the left sidebar you can see links for all of my social media accounts, Facebook, Etsy, Ebay, Twitter, etc. Please feel free to follow me on any or all of them. Or you can simply contact me by email at neworleanscraftsbydesin@gmail.com or use the contact form on the left sidebar.